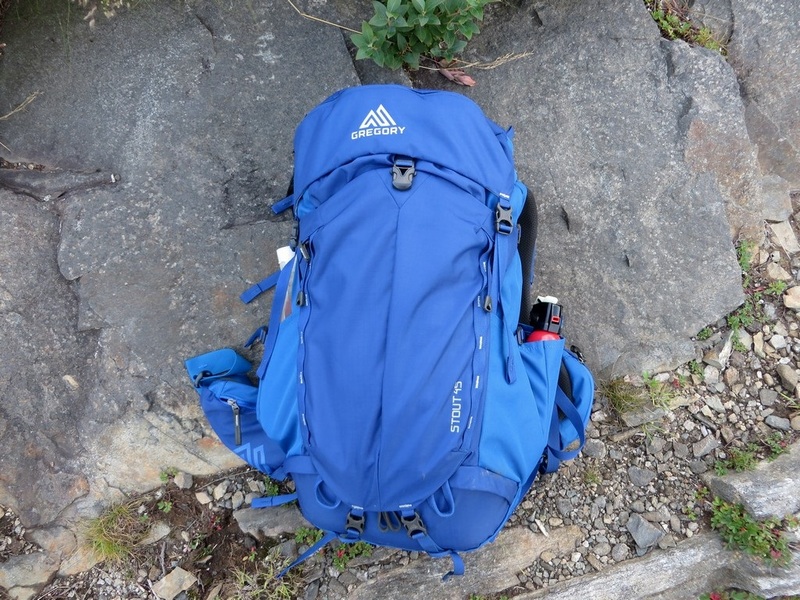 The Stout 45, a new pack for 2015 from Gregory, is aimed at weekend warriors and light weight backpackers who are working towards going lighter and faster. Gregory has been producing packs since 1977, but does their experience still translate into great backpacks? Let’s have a look. The Stout 45 is built upon a very light weight frame, paired with thick generous padding. This comes together to make a light weight, but comfortable pack. The framing itself is thin, and almost wire like, and is ran through the back of the pack. 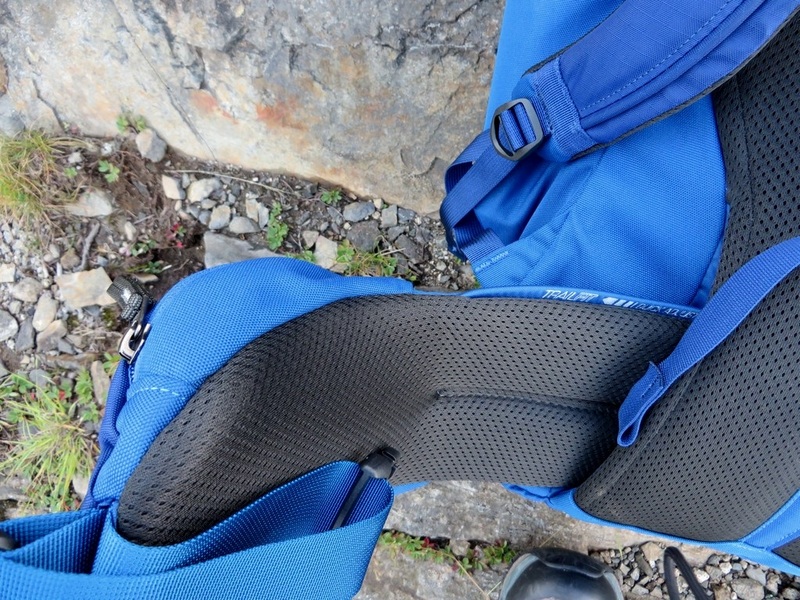 They call this the TrailFlex suspension, as it flexes a bit as you hike, but doesn’t collapse under weight. The pack is built from a durable polyester, and comes equipped with a removable lid as well as an included rain cover that stashes inside its own pocket. 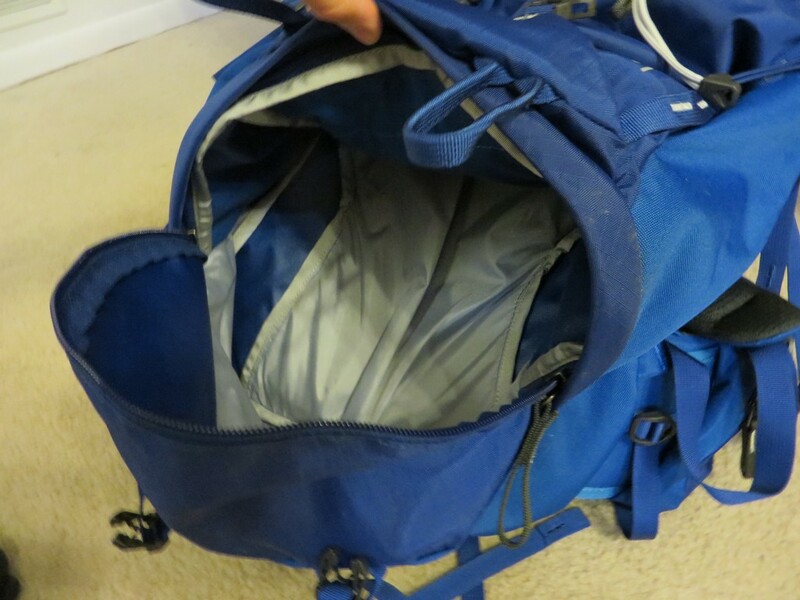 The main compartment is a simple gap opening with a cinch and compression strap for sealing it up. Oversized pockets on the adjustable hip belt, as well as a large lid and stash pocket on the rear allows for organization. The pack retails for $169, and weighs 3 lbs 3 oz for the medium size (large available at 3 lbs 6 oz). Despite having a thin, lightweight frame, the Stout 45 managed to carry everything I could possibly stuff into the backpack with no problems at all (I stuffed that thing until I could barely cinch it closed!). It not only handled the weight, but it transferred the load straight to the hips while leaving my shoulders tension free. The frame eliminates any bulging against the spine that may become a problem in lesser packs, while the generous padding along the back and hips provides squishy goodness, while also helping to keep the pack in place. It comes together to make a supremely comfortable pack, that doesn’t weigh you down. The pack offers up plentiful pockets for those who are inclined to organize. The two large hip pockets hold even larger cameras and snacks, while the top lid works great to hold items you will need to access often. A large stash pockets works for rain gear and layers, and a hidden pocket under the lid does a great job of hiding wallets and phones. A dedicated rain cover compartment always comes in handy. External straps allow you to over pack the backpack by strapping tents or sleeping bags under the pack. Two large, adjustable pockets allow you to store water bottles, bear mace, tripods, and other gear as well. 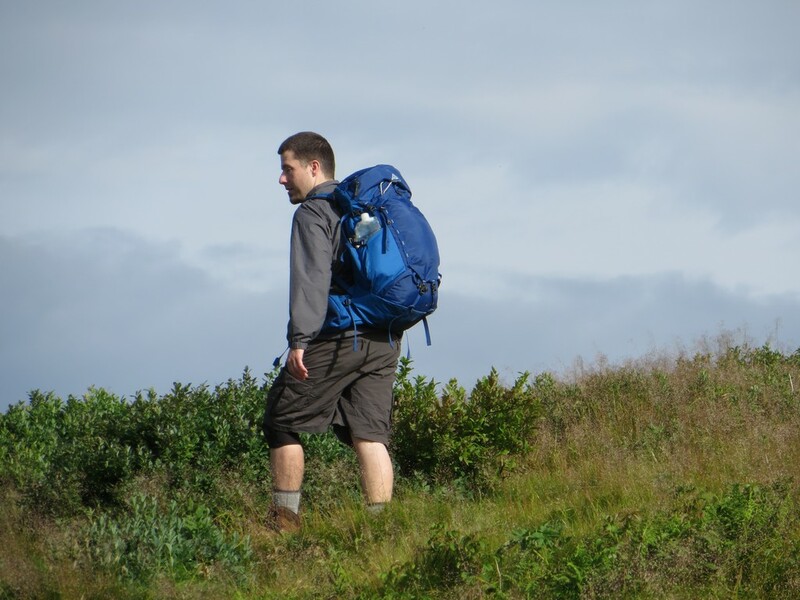 The pack cinches down nice and tight, providing wiggle free backpacking even across rocky terrain. The stability it provides reduces fatigue by means of reducing the inertia you’re working against while walking. The value here is quite impressive. $169 for a pack of this build quality and weight isn’t bad at all and it’s also one of the best values on the market right now. The materials are rugged, and thick enough that they’re going to last years of abuse. The smaller size influences better packing and leaving unnecessary items at home, while also providing a less top-heavy pack which improves stability and safety. 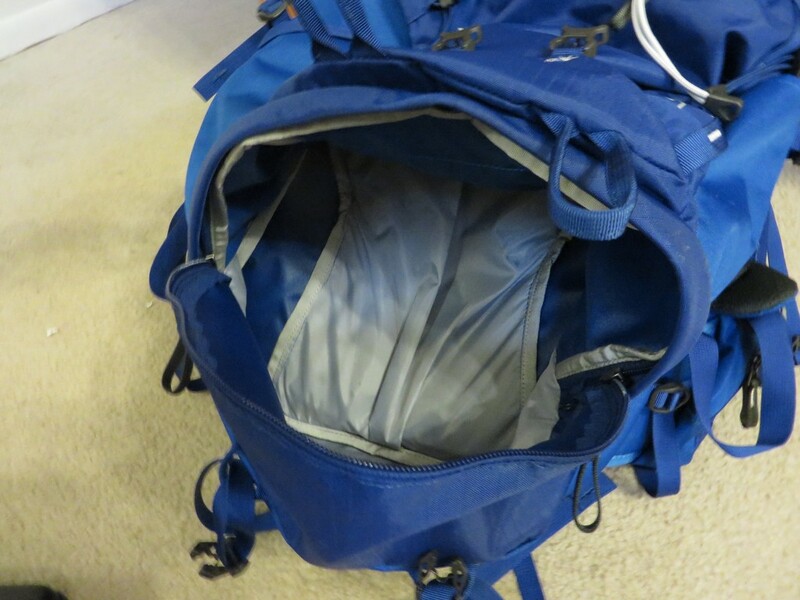 The lid pocket sits at an angle and has a very low zipper, making items stored inside susceptible to dumping out if you’re not careful. The smaller lid pocket on the front is quite prone to hanging up on my particular pack, requiring two hands to avoid the situation. I can’t seem to find a key ring attachment anywhere, but luckily the internal hidden pocket works well enough to keep them safe. The smaller size is somewhat restrictive, creating a challenge in areas that require bear canisters or lots of heavy warm layers, but luckily the external straps allow for over packing. The Stout 45 is an impressive piece of equipment for the weekend warrior or those who are dedicated to packing fast and light. The build quality is excellent, providing durability and comfort well outside its price range. A built-in rain cover (another bonus), plenty of storage/organization, and exceptional comfort and flexibility makes this one of the best packs that we’ve tested. Keep an eye on the items that are stored inside the top lid, and the Stout 45 is an exceptional backpack. For more information, check out The Stout 45 on Gregory’s website. Big thanks to Gregory for providing this great piece of equipment for review. A breakdown of our rating system and our full disclosure can be found on our about us page. If you have any questions or comments, don’t hesitate to post below or send us an email. By request, here are a couple photos of the bottom compartment. Can you post a couple of pictures of how the bottom compartment works and looks. I’m considering using this pack to put a dslr and a couple lens into that bottom area and would like an idea of if it would work. Thanks in advance. Sure thing. I’ll try to get a few photos up for you tomorrow. You’re talking about the sleeping bag compartment? Yep. Looks like it might be big enough. I have a couple images up now. Let me know if that is what you’re looking for. That’s exactly what I was looking for. Thanks! Hi. That’s a great question. The top lid can come off, although it’s not as simple as a couple clips. It requires undoing a couple strap tensioners, which will take a little longer than preferable. I do not see any obvious way of using it as a separate hip pack however. There are no connection points or auxiliary straps to use. Thanks for your in depth review of this pack. Regarding the color, I was considering the 35L in the blue (officially Marine Blue on Gregory’s site), but in some of your pictures it appears there may be a purple tint to it. Since you’ve seen it in person and in different lights, how would you describe the “blue”? I would describe this as a nice deep blue. It’s a great looking color, and a nice looking pack overall. I haven’t noticed any hint of purple at all. Great! Thanks for your quick response. That’s what I wanted to know. Any time. Let me know if i can be of any more help! Love the review thanks. 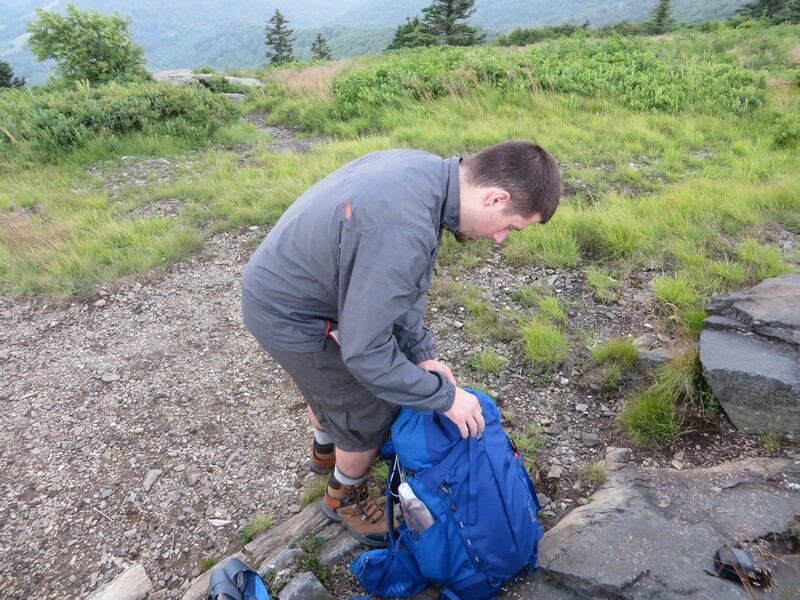 I’m mlooking into a pack as my main bag for hiking the white mountains in nh. I’d like to get this bag (stout 45) but what’s your thoughts about being able to carry a md size sleeping bag in the bottom? Do you feel this pack would work as a solo 3 night bag. I’ve got a small tent I could daisy chain but I’d like to try and avoid a 65l pack if I can. I’m not an ultra light geek but I do believe less is more. Any help would be great. Thanks for the excellent question. 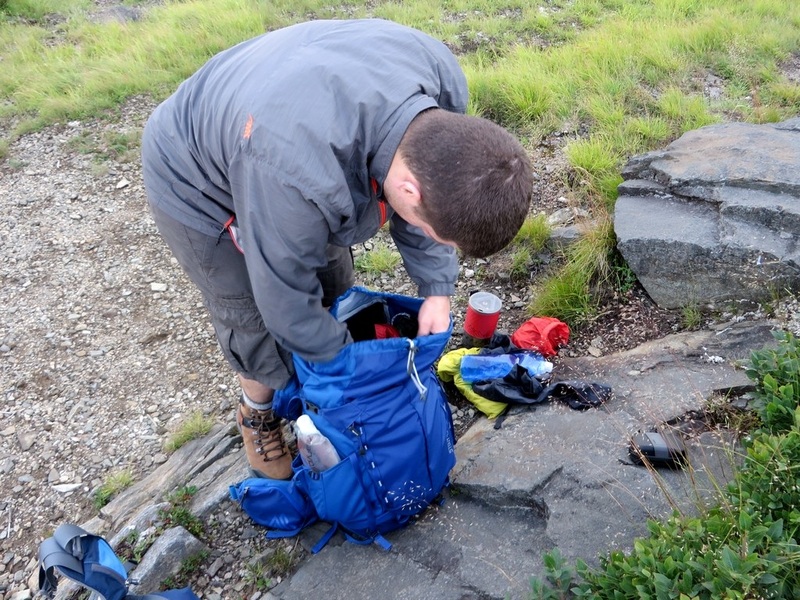 The Stout 45 can certainly be used for a 3 night pack, but you’re going to have to have a small initial pack size. If you have an ultra light tent, sleeping bag and pad you can probably pull it off. What do you consider a medium sized bag? Do you happen to know the name of the sleeping bag or the weight? I often carry a Nemo Siren quilt, a fairly bulky Thermarest Prolite, and Big Agnes Fly Creek and it would do well as a 3 night pack in good weather (no down jackets or anything). If you’re thinking of year round use though, it would be a real challenge to use with bulky winter gear. It can certainly be an expensive sport. Try checking out outlet sites like REI Garage, Sierra Trading Post and even Craigslist. You can really score some excellent deals at thrift shops, if you’re especially lucky. Thanks for reading and replying. I love the gear chat! Good luck on your adventures! Can you possibly show a picture of how the shoulder torso suspension on this pack is adjusted? From the many pictures here and elsewhere, I determined that the waist-belt pads Velcro onto a waist belt base. But I cannot see how (or if) the torso is adjusted (adjustable). If no pictures, then just a description on how to do it would be great! The one I tested doesn’t really adjust as far as torso length. All I can really do is loosen up the shoulder straps on this one. The newer model I believe does adjust. 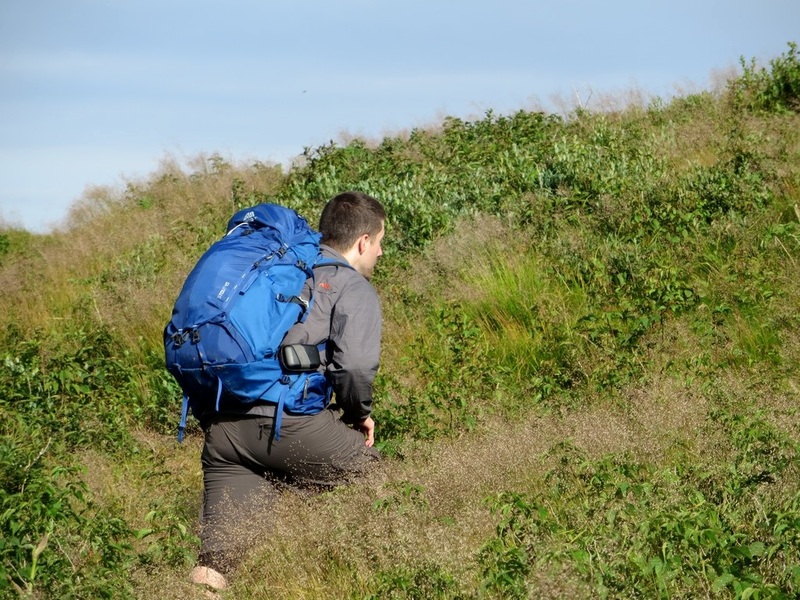 At this weight, most people just sit the pack higher up on their hips and it works out pretty well, unless you’re a taller guy. That’s me, a taller guy. Technically, a tall sitter. I have 22 to 22.5 inch torso, so I am usually setting packs up for their maximum torso setting. Packs that only go to 21 inches (about 50% of them) are usually two short for me. Thanks for the info. I’m going to go out on a limb here and say this will probably be too short for you. I’m 5’8″, and I almost wish it was a little taller, just to get the straps off my shoulders a bit. I’ve not tested their newest packs, but I’ll see what I can do about that as many now come in a large. I was wondering if it has room for a water resorvoir? 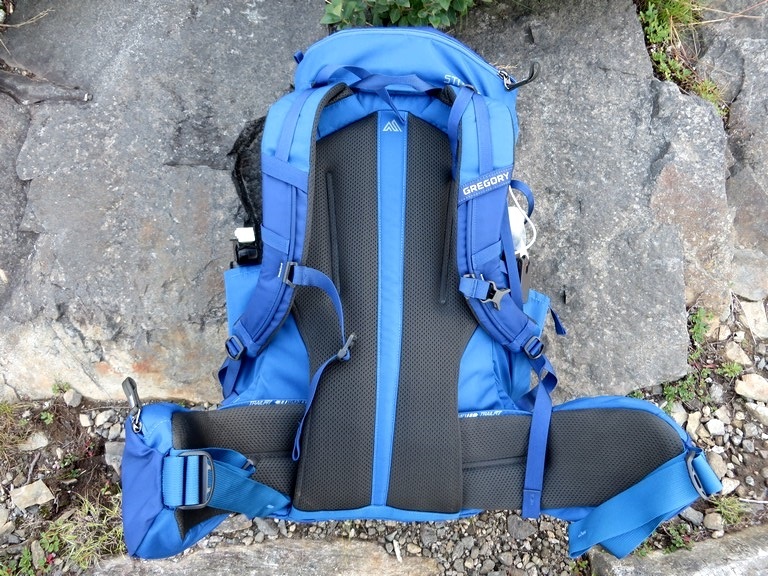 I’m looking for a versatile pack for Mt Kilimajaro. I’ll have a porter so will just need a nice daypack, small enough to carry-on a plane but big enough to at least carry winter clothing for summit day. Thanks for any input or advice. There certainly is. I carry a two liter Platypus bottle internally, and often a liter or two externally as well. There is even routing if you’re wanting to use a hydration tube. Space available will mostly rely on your other gear, but I make it work for overnight trips no problem. If you’re just day hiking it will be more than large enough, even will a full suite of winter gear. Thanks for your help. I’m torn between the Gregory 45 Stout and the Osprey Packs AG 36 Hydration. Those are both great packs. My thoughts, the Stout 45 can double as an overnight bag for summer, which is nice. My complaint with Osprey packs is how far they hang off the body. I always feel like they’re a bit unbalanced for that reason. There is a middle ground in the Gregory Salvo 28 if you can find one (my current day pack), or perhaps the new Zulu 30 (although I haven’t tested that yet). It has the air suspension, but it’s closer to the spine to maintain that balance and stability. Personally, between the two you have in mind though, I would think the Gregory is my pick, but perhaps on the large side if you’re only doing day hikes. Thanks soo much for all the feedback!